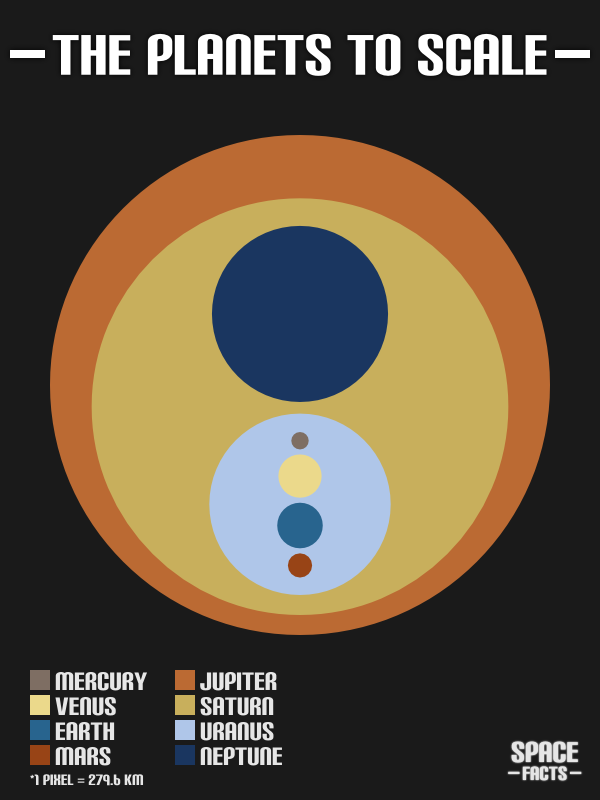 A graphic showing all 8 planets in our solar system, Mercury through to Neptune, to scale where one pixel = 279.6 km. Scales were worked out with this very useful solar system scale calculator. Find out more about the planets on the Planet Facts page. Any chance of getting a high-res version of this to print out? I would SO love this on a Ladies Tee! PLEASE PLEASE PLEASE give us a higher res version, would make an epic poster! I am looking for a font that matches that one, I have made a quick 61×84 cm version of this, roughly, since I liked it as well. Once I find a matching font I will post it here. This is my version of it, I got rid of the pixel scale conversion because it wouldn’t apply once you’ve printed it out. I can definitely put it back up and upload that if anyone wants, but it doesn’t make sense. It is 61cm X 84.43cm @300 DPI. Thanks Chris for the font, I even checked on MyFont.com by starting a thread and it was confirmed that it was indeed Carbon Block. Very cool, thanks some dude! For some reason it’s not right. The original file is 7205 x 9972 pixels, much larger than what was uploaded there. I’ll see what the problem is, try to find another place to upload it, and repost it when I do. Obviously, credit goes 100% to the original creator. Could I pleeeeeeeese, pretty please, get a high rez copy? cool man that’s just cool!!!!!!!!!! this is the best webist that i have been on !!!!!!!!!!!!!!!!!!!!!!!!!!!!!!!!!!!! Without the stupid web adress at the bottom I’d definitely buy it. Done, originally did the poster version at request for an education establishment to use for free so wanted a bit of self promotion there. The font used is a bit thick, can’t it be like Neuton (Source) or the ‘Impact’?